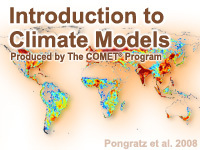 This module explains how climate models work. Because the modeling of both weather and climate share many similarities, the content throughout this module draws frequent comparisons and highlights the differences. We explain not only how, but why climate models differ from weather models. To do so, we explore the difference between weather and climate, then show how models are built to simulate climate and generate the statistics that describe it. We conclude with a discussion of models are tuned and tested. Understanding how climate responds to changes in atmospheric composition and other factors drives climate research. Climate models provide a tool to understand how processes work and interact with each other. Our intended audience is the weather forecasting community: those who are already familiar with NWP models. Non-forecasters with an interest in weather and climate should also find the module useful. The content is not overly technical and the goal of this module is not to train people to develop climate models but to highlight the similarities and differences between weather and climate models. This lesson is too advanced, uses too many unexplained acronyms and covers too much material for a one hour class. It needs to be split into two or three separate classes--each one hour. This lesson helps you remember what you learn. Very neat! Some of the questions are difficult to understand or remember the answer when going through all the information. Although the questions are important I think they could be improved by being more clear or referring to which section they were from. It is helpful to others who study about climate modeling. It is the basic of the climate modeling. It is interesting for me, good. It was great and satisfying. Taking up this lesson provides me with proper insights regarding the climate model even though I am new to this kind of topic. Just go through the questions without thinking too much about it. This is an assessment, not a graded final exam. Answer truthfully and the system (provided it is well programmed) will guide you to the right 'first' lesson for you. Overall, the experience was okay, I just struggle with understanding the material. Good overall coverage of climate modeling. Excellent intro to climate models. Explains a lot especially comparing climate models to weather models. At times, a bit technical but if the user sticks with it they will get a lot out of this module.